"The Burning Legion has returned", and that's bad news for Azeroth. The next World of Warcraft expansion is called Legion. It includes a new continent called The Broken Isles, a level cap hike to 110, new dungeons and raids, a new honor system, artifact weapons, class order halls and a new demon hunter class. The Broken Isles is a long forgotten land that lies at the heart of Azeroth. It used to be a thriving Night Elf civilisation. Now it's "a graveyard of sorts" that features the Tomb of Sargeras, itself a gateway to endless legion worlds. 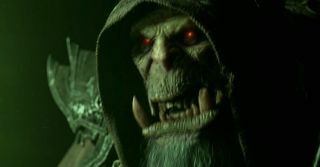 A brief cinematic shown at the start of the presentation suggests that this is largely Gul'dan's fault. Whatever the reason, a demonic invasion is coming—the "biggest invasion of Azeroth ever", in fact—and an army of heroes is needed to stop it. Artifacts should help. These custom weapons are powerful enough to battle the invaders, and forging them will be an important part of Legion's story. There are 36 versions for different specialisations, and all can be altered to suit your tastes. As the weapon grows in power you can significantly change the way it looks, and unlock a tree of traits that synergise with your class in powerful ways. One trait for the Death Knight's artifact lets them resurrect, for example. Druids who can't wield a giant impressive sword or hammer can instead customise their form. Blizzard feels "as though we've done dungeons a bit of a disservice". The plan is to do more dungeons in Legion, and give players more reasons to keep running them. Blizzard showed stills of the Halls of Valor—a golden palace inspired by the mythical halls of Valhalla. Black Rook Hold is set in an ancient elven military structure carved out of a mountain, and the Vault of the Wardens will offer more insight into Gul'dan's schemes. Blizzard listed six other dungeons, the Eye of Azshara, Darkheart Thicket, Neltharion's Lair, Helheim, Suramar City and Violet Hold. Two raids were mentioned. The seven-boss Emerald Nightmare is a prototype version of Azeroth created by the titans, but it's become corrupted and needs to be cleaned out. Suramar Palace features ten bosses and you get to finally punch Gul'dan at the end. That's set in an open elven city area that looks a bit like this. Now for the new class, the demon hunters. Expect a "very unique starting experience". They start at a high level so you can immediately go into the Legion areas. Two specialisations are mentioned: havoc (DPS) and vengeance (tank). As you might guess from their aggressive horned faces, Demon hunters don't really heal much. Here are some things that demon hunters can do. Eye lasers! Chaos explosions! Wall-hack mode! Legion will significantly change the honor system. WoW devs feel that there can be too much of a power disparity in PvP, and want gear to be less important. The new honor system lets you achieve ranks to unlock PvP talents designed exclusively for player vs player combat. As you push up through the ranks can pick and choose from a growing skillset to customise your tactics. You can also reset your honor level to gain prestige ranks and unlock cosmetic rewards (including unique PvP looks for your artifacts). It's clearly inspired by Call of Duty's prestige system, but in CoD you don't get to unlock huge flaming swords. Here are some sample talents. Phew! Blizzard does not mess around when it wants to announce something, and more is sure to be revealed in the coming weeks. What do you think of Legion? Will it keep you playing WoW?